Michael Keating, the Special Representative of the Secretary-General and Head of the UN Assistance Mission in Somalia (UNSOM), briefs the Security Council. Grappling with turbulent politics, persisting terrorism and the risk of famine, Somalia must make 2018 a year of carrying out reforms, a senior United Nations official said Wednesday, urging more international financial and technical support for the Horn of Africa country that underwent a peaceful transition of power to a new President a year ago. Mr. Keating said the Somali leader has crafted a commendable national agenda embracing financial reform, job creation, inclusive politics, conflict resolution and reform of the security sector. In implementing this multi-pronged agenda, the Federal Government faces several major challenges, including the mobilization of adequate technical and financial capacity, ensuring coherent and coordinated approaches by both national and international actors, and managing the powerful constituencies that need to be on side, such as federal member states, parliamentarians, clan power brokers, the private sector and international partners. “I strongly encourage Somali stakeholders to unite to tackle these priorities and to make 2018 a year of implementation,” Mr. Keating said. On the political front, he said that, in December, tensions were sharply raised in Mogadishu by the violent arrest of a prominent opposition politician by the national intelligence and security agency and the raid on the house of a leading parliamentarian. The recent replacement of the Mayor has also created waves. VIDEO: UN envoy for Somalia, Michael Keating, outlines multi-faceted approach to helping the country get back on its feet. Turning to the humanitarian situation, he said that the risk of famine still looms after four consecutive failed rainy seasons, and the 2018 relief aid plan calls for $1.6 billion. “Chronic poverty and persistent humanitarian needs cast an ominous shadow over Somalia,” he warned, noting that an estimated 6.2 million people are in need of assistance. “Continued support will be needed to help Somalia break the cycle of recurrent crises that cause so much suffering and undermine the peacebuilding and state-building process,” he stressed. Central to that process is gaining political agreement as to how power will be exercised, shared and accounted for. This requires progress in three key areas: review of the provisional federal constitution; preparation for elections in 2020-21; and conflict resolution and reconciliation, he said. A serious danger exists that long-standing disputes between Puntland and Somaliland, and in particular an armed stand-off in Sool, could erupt into violence in the coming days. “With the support of international partners including many on this Council, I have urged the leaders of Puntland and Somaliland to declare a cessation of hostilities, withdraw their forces, restore the status quo ante, and open channels of communication,” he said. Al-Shabaab remains a potent threat, despite or perhaps because it is on the back foot as a result of financial pressures, counter terrorism operations and air strikes, Mr. Keating said, noting that on 14 October, Mogadishu suffered the deadliest attack using improvised explosive devices, with an estimated 512 people killed, nearly all civilians. “Defeating Al Shabaab requires both a military and political strategy, the use of both sticks and carrots, as well as sustained efforts to address deficits that lend extremists a degree of credibility,” he said. These deficits include corruption, lack of education and job opportunities for young people, weak national justice and corrections capacity, and grievances arising from unresolved disputes. The African Union Mission in Somalia (AMISOM) remains fundamental for security in the country, but this year will require dedicated effort by the Somali leadership, the African Union and international partners to build political acceptability and operational capability of the Somali security sector, which should enable AMISOM gradually to hand over responsibility to Somali security forces. AUDIO: UN Special Representative Michael Keating outlines how the UN is working with the government and National Independent Electoral Commission to prepare a roadmap towards elections in 2020. To that end, on 4 December, the Federal Government of Somalia and the federal member States, agreed to develop a transition plan in the first quarter of this year, working closely with international partners, most importantly the African Union, troop and police contributing countries and major international investors in Somalia’s security, including the European Union. “Premature drawdown of AMISOM forces will be a gift to Al Shabaab and risks undermining the gains that have been made, at great human and financial cost, over the last decade,” he said. Somalia is making definite progress, but continued progress is dependent not only on the strong political will and skill of the federal government, but also cooperation and partnership with federal member states, parliament, clan elders, business and international partners. “When all of these constituencies cooperate, huge strides can be made,” he said. 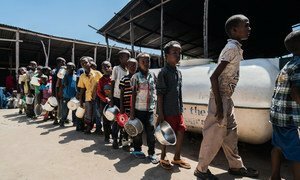 While Somalia, with the international community’s help, averted famine last year, long-term solutions for drought, conflict and displacement must still be found, the United Nations office in the country said Wednesday, launching the 2018 humanitarian response plan, which calls for $1.6 billion to protect the lives of 5.4 million people.